This is “Entering, Editing, and Managing Data”, section 1.2 from the book Using Microsoft Excel (v. 1.1). For details on it (including licensing), click here. In this section, we will begin the development of the workbook shown in Figure 1.1 "Example of an Excel Worksheet with Embedded Chart". The skills covered in this section are typically used in the early stages of developing one or more worksheets in a workbook. Activate cell location A2 on the worksheet. 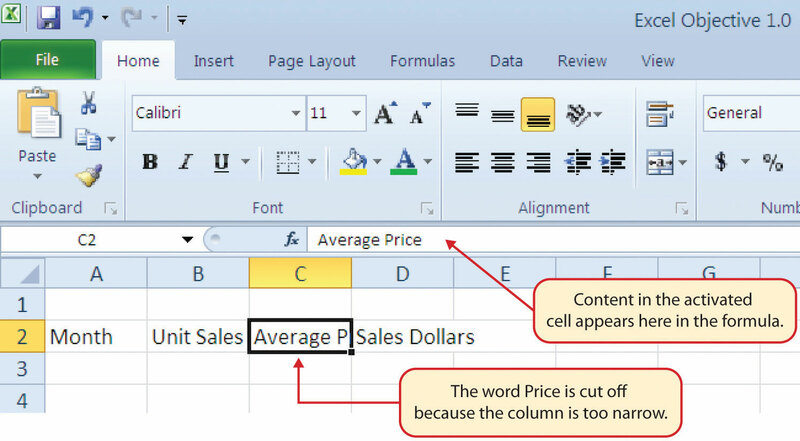 Repeat step 4 for the words Average Price and Sales Dollars. 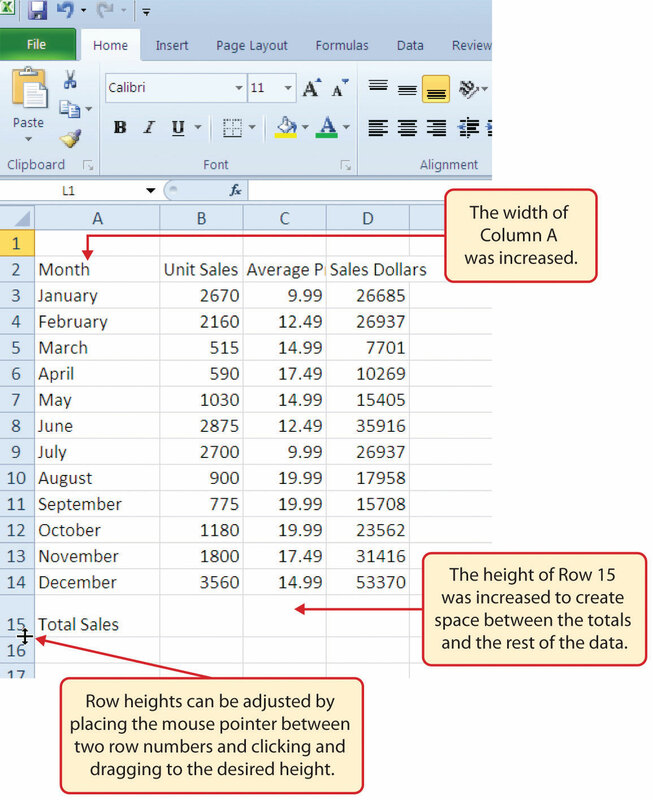 Figure 1.17 "Entering Column Headings into a Worksheet" shows how your worksheet should appear after you have typed the column headings into Row 2. Notice that the word Price in cell location C2 is not visible. This is because the column is too narrow to fit the entry you typed. We will examine formatting techniques to correct this problem in the next section. Repeat step 7 by entering the following numbers in cells B4 through B14: 2160, 515, 590, 1030, 2875, 2700, 900, 775, 1180, 1800, and 3560. Repeat step 10 by entering the following numbers in cells C4 through C14: 12.49, 14.99, 17.49, 14.99, 12.49, 9.99, 19.99, 19.99, 19.99, 17.49, and 14.99. Repeat step 13 by entering the following numbers in cells D4 through D14: 26937, 7701, 10269, 15405, 35916, 26937, 17958, 15708, 23562, 31416, and 53370. 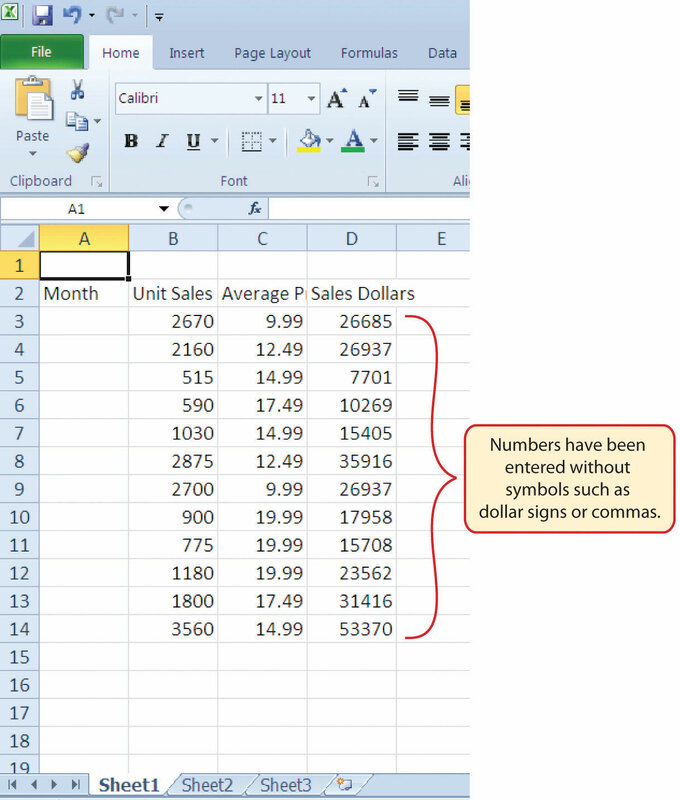 Figure 1.18 "Completed Data Entry for Columns B, C, and D" shows how your worksheet should appear after entering the data. Check your numbers carefully to make sure they are accurately entered into the worksheet. Activate cell A15 in the Sheet1 worksheet. Click the checkmark to the left of the Formula Bar (see Figure 1.19 "Using the Formula Bar to Edit and Enter Data"). This will enter the change into the cell. Activate cell A3 in the Sheet1 worksheet. Move the mouse pointer to the lower right corner of cell A3. You will see a small square in this corner of the cell; this is called the Fill HandleA small square in lower right corner of an activated cell. When the mouse pointer gets close to the Fill Handle, the white block plus sign turns into a black plus sign. (see Figure 1.20 "Fill Handle"). When the mouse pointer gets close to the Fill Handle, the white block plus sign will turn into a black plus sign. Once you release the left mouse button, all twelve months of the year should appear in the cell range A3:A14, as shown in Figure 1.22 "Auto Fill Options Button". You will also see the Auto Fill Options button. By clicking this button, you have several options for inserting data into a group of cells. Left click the Auto Fill Options button. Left click the Copy Cells option. This will change the months in the range A4:A14 to January. Left click the Auto Fill Options button again. 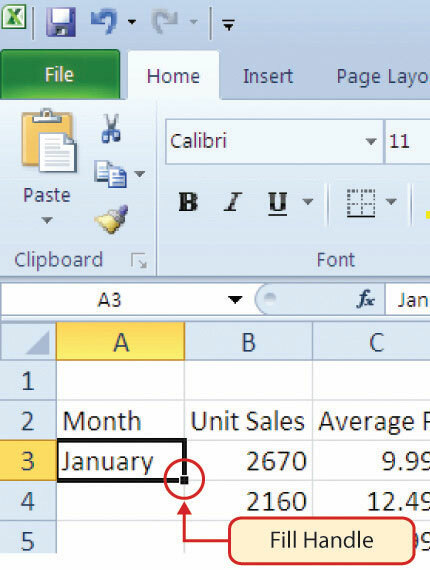 Left click the Fill Months option to return the months of the year to the cell range A4:A14. The Fill Series option will provide the same result. Activate cell C2 by placing the mouse pointer over the cell and clicking the left mouse button. 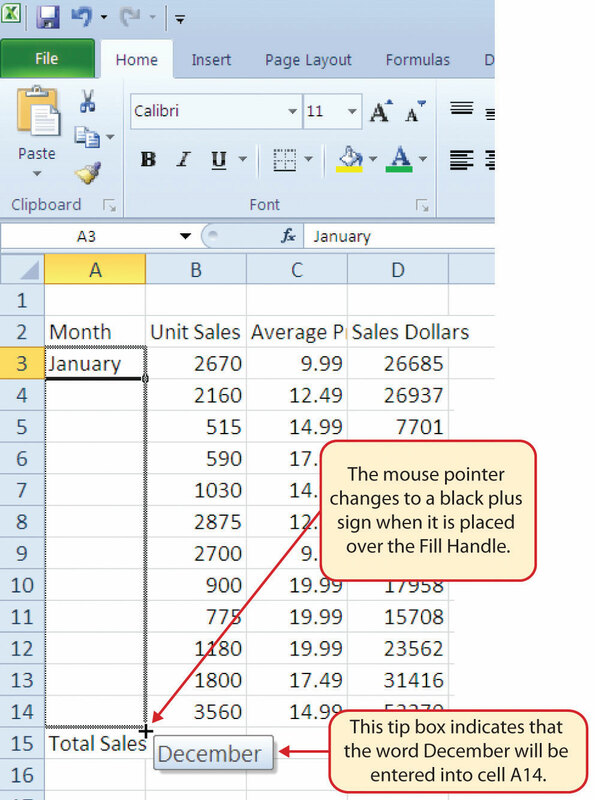 Left click and drag the mouse pointer up to cell C3 (see Figure 1.23 "Using Auto Fill to Delete Contents of Cell"). Release the mouse button. The contents in the range C3:C14 will be removed. Click the Undo button in the Quick Access Toolbar (see Figure 1.3 "Blank Workbook"). This should replace the data in the range C3:C14. Click the Clear button in the Home tab of the Ribbon, which is next to the Cells group of commands (see Figure 1.24 "Clear Command Drop-Down Menu"). This opens a drop-down menu that contains several options for removing or clearing data from a cell. Notice that you also have options for clearing just the formats in a cell or the hyperlinks in a cell. 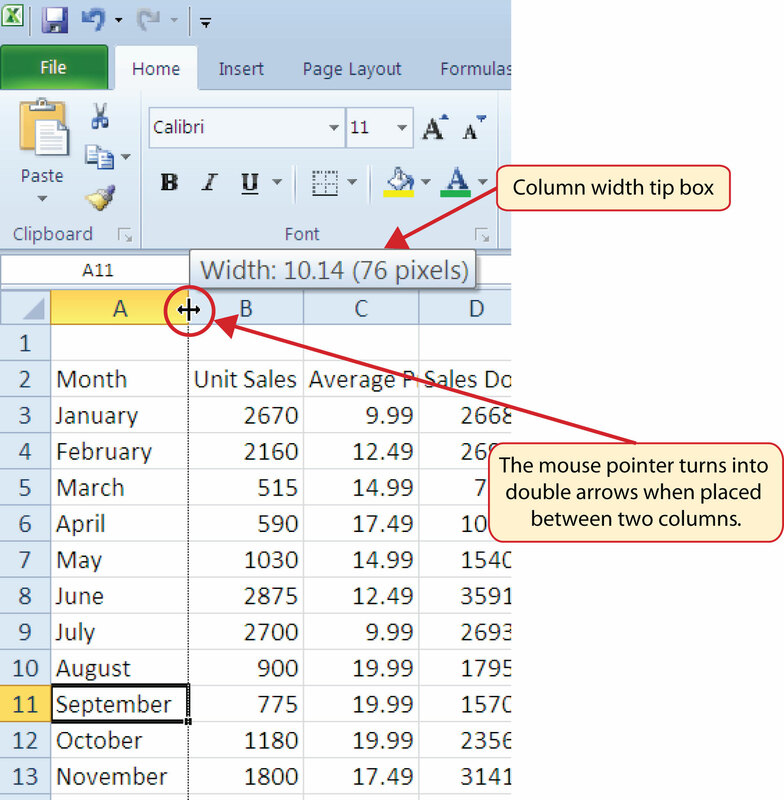 Bring the mouse pointer between Column A and Column B in the Sheet1 worksheet, as shown in Figure 1.25 "Adjusting Column Widths". You will see the white block plus sign turn into double arrows. 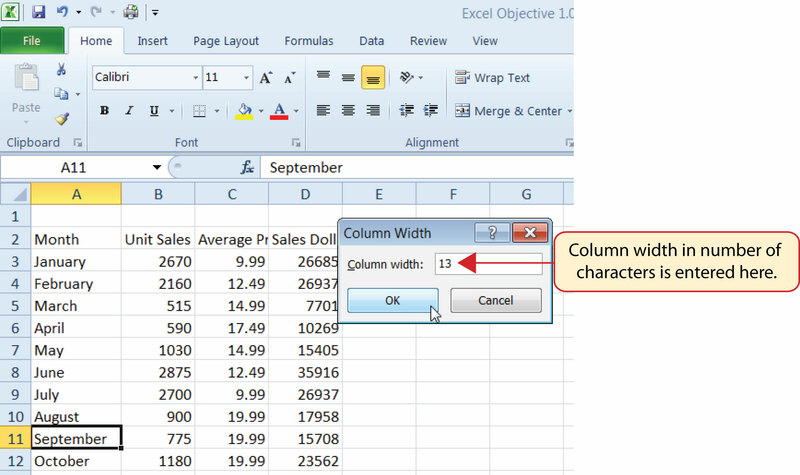 Left click and drag the column to the right so the entire word September in cell A11 can be seen. As you drag the column, you will see the column width tip boxA box that appears when the width of a column is being adjusted using the click-and-drag method. It displays the number of characters that will fit into the column using Calibri 11-point font.. This box displays the number of characters that will fit into the column using the Calibri 11-point font. Activate any cell location in Column A by moving the mouse pointer over a cell location and clicking the left mouse button. You can highlight cell locations in multiple columns if you are setting the same character width for more than one column. 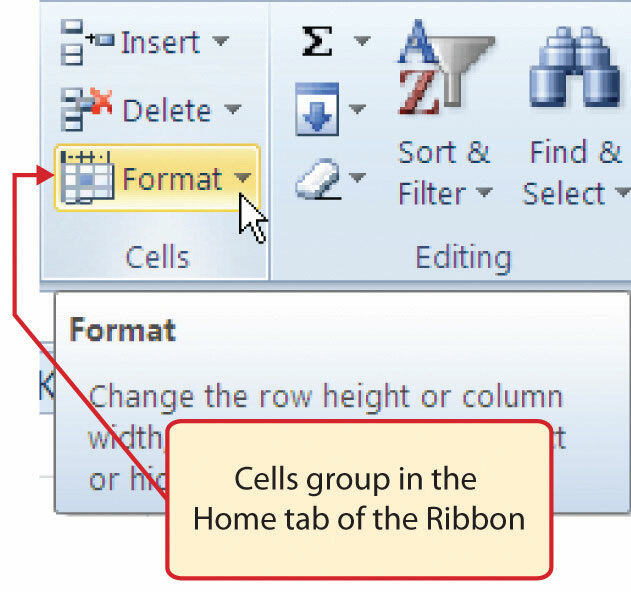 In the Home tab of the Ribbon, left click the Format button in the Cells group (see Figure 1.26 "Cells Group in the Home Tab"). Click the Column Width option from the drop-down menu (see Figure 1.27 "Format Drop-Down Menu"). This will open the Column Width dialog box. Type the number 13 and click the OK button on the Column Width dialog box. This will set Column A to this character width (see Figure 1.28 "Column Width Dialog Box"). Activate cell A15 by placing the mouse pointer over the cell and clicking the left mouse button. Click the Row Height option from the drop-down menu (see Figure 1.27 "Format Drop-Down Menu"). This will open the Row Height dialog box. Type the number 24 and click the OK button on the Row Height dialog box. This will set Row 15 to a height of 24 points. A pointMetric used when measuring the height of a row; equivalent to approximately 1/72 of an inch. is equivalent to approximately 1/72 of an inch. This adjustment in row height was made to create space between the totals for this worksheet and the rest of the data. Figure 1.29 "Excel Objective 1.0 with Column A and Row 15 Adjusted" shows the appearance of the worksheet after Column A and Row 15 are adjusted. In addition to adjusting the columns and rows on a worksheet, you can also hide columns and rows. This is a useful technique for enhancing the visual appearance of a worksheet that contains data that is not necessary to display. 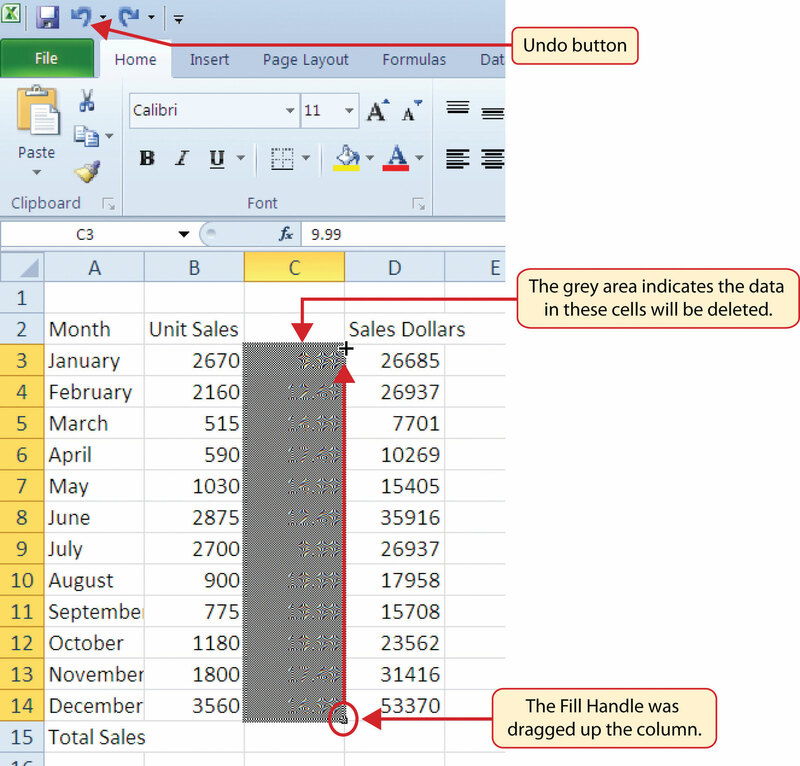 These features will be demonstrated using the Excel Objective 1.0 workbook. However, there is no need to have hidden columns or rows for this worksheet. The use of these skills here will be for demonstration purposes only. Activate cell C1 in the Sheet1 worksheet by placing the mouse pointer over the cell location and clicking the left mouse button. Place the mouse pointer over the Hide & Unhide option in the drop-down menu (see Figure 1.27 "Format Drop-Down Menu"). This will open a submenu of options. Click the Hide Columns option in the submenu of options (see Figure 1.30 "Hide & Unhide Submenu"). This will hide Column C.
Figure 1.31 "Hidden Column" shows the workbook with Column C hidden in the Sheet1 worksheet. You can tell a column is hidden by the missing letter C.
Place the mouse pointer over the Hide & Unhide option in the drop-down menu (see Figure 1.27 "Format Drop-Down Menu"). Click the Unhide Columns option in the submenu of options (see Figure 1.30 "Hide & Unhide Submenu"). Column C will now be visible on the worksheet. 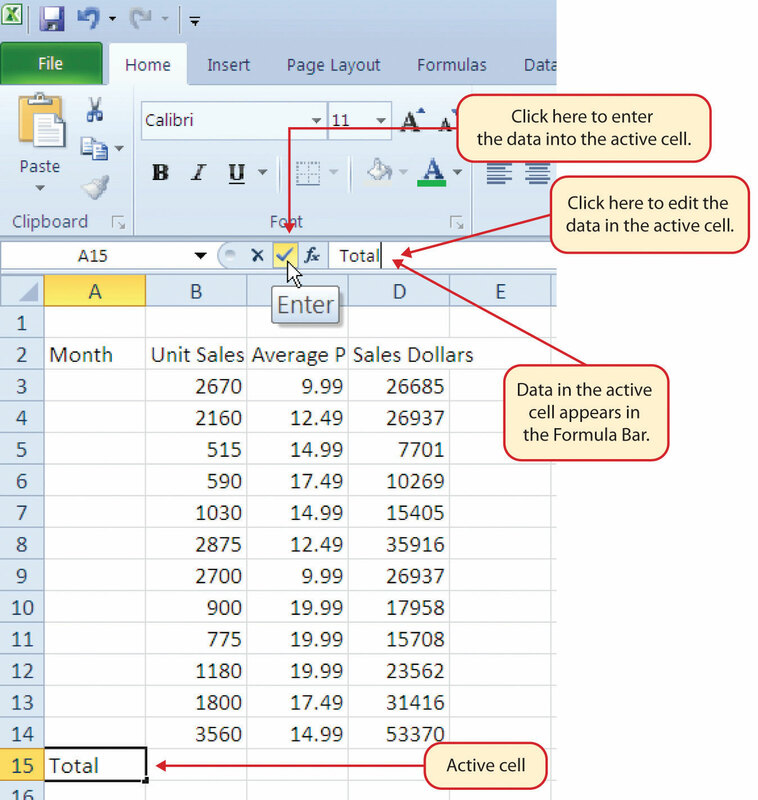 Activate cell A3 in the Sheet1 worksheet by placing the mouse pointer over the cell location and clicking the left mouse button. Click the Hide Rows option in the submenu of options (see Figure 1.30 "Hide & Unhide Submenu"). This will hide Row 3. Click the Unhide Rows option in the submenu of options (see Figure 1.30 "Hide & Unhide Submenu"). Row 3 will now be visible on the worksheet. Click the down arrow on the Insert button in the Home tab of the Ribbon (see Figure 1.32 "Insert Button (Down Arrow)"). 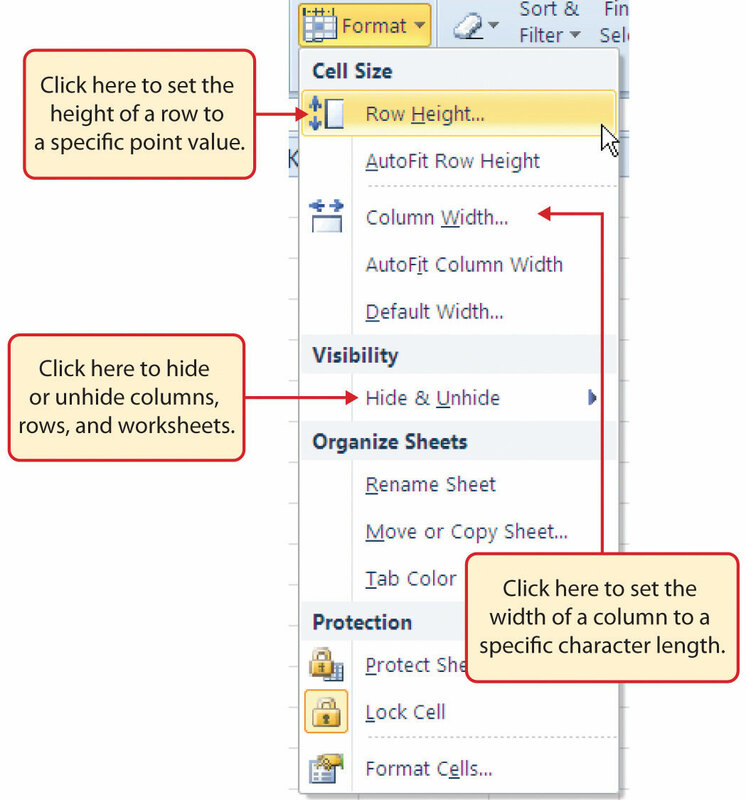 Click the Insert Sheet Columns option from the drop-down menu (see Figure 1.33 "Insert Drop-Down Menu"). A blank column will be inserted to the left of Column C. The contents that were previously in Column C now appear in Column D. Note that columns are always inserted to the left of the activated cell. 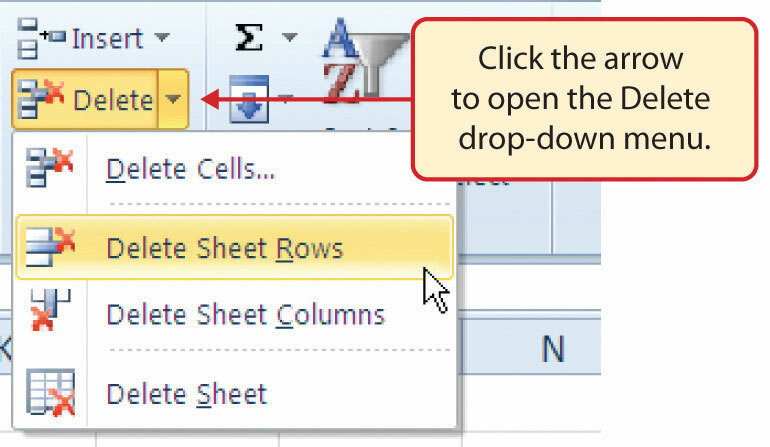 Click the Insert Sheet Rows option from the drop-down menu (see Figure 1.33 "Insert Drop-Down Menu"). A blank row will be inserted above Row 3. The contents that were previously in Row 3 now appear in Row 4. Note that rows are always inserted above the activated cell. Bring the mouse pointer to the left edge of cell D2. You will see the white block plus sign change to cross arrows (see Figure 1.34 "Moving Data"). This indicates that you can left click and drag the data to a new location. Activate cell A3 by placing the mouse pointer over the cell location and clicking the left mouse button. 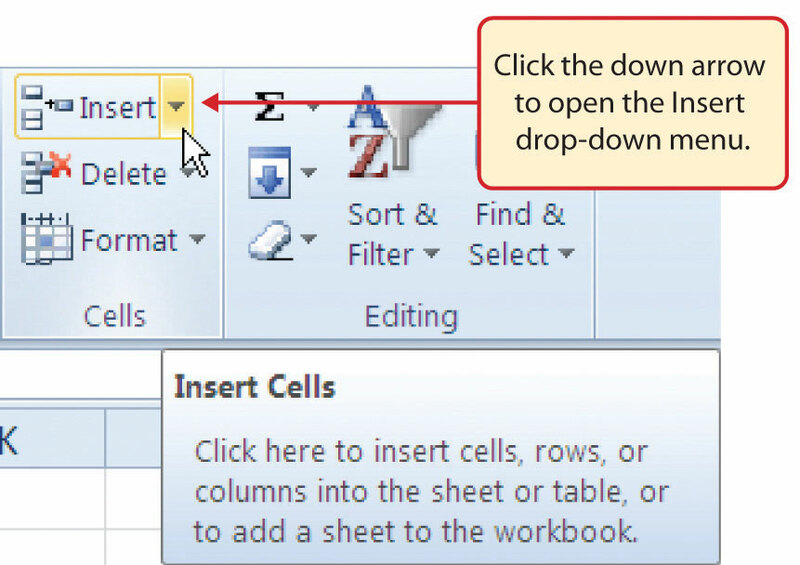 Click the Delete Sheet Rows option from the drop-down menu (see Figure 1.35 "Delete Drop-Down Menu"). This removes Row 3 and shifts all the data (below Row 2) in the worksheet up one row. Activate cell C1 by placing the mouse pointer over the cell location and clicking the left mouse button. 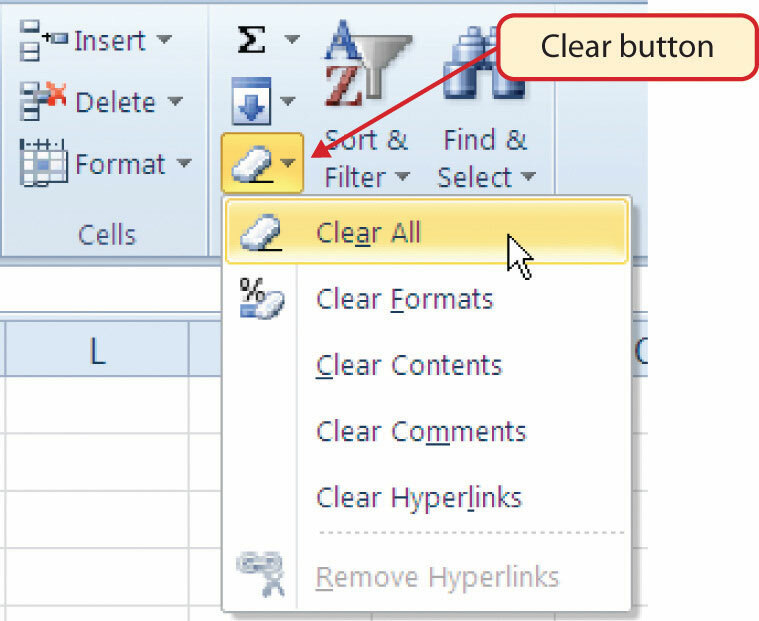 Click the Delete Sheet Columns option from the drop-down menu (see Figure 1.35 "Delete Drop-Down Menu"). This removes Column C and shifts all the data in the worksheet (to the right of Column B) over one column to the left. When using a worksheet that was developed by someone else, look carefully for hidden column or rows. These numbers will not be usable in mathematical functions or formulas. Excel will convert this to text data. 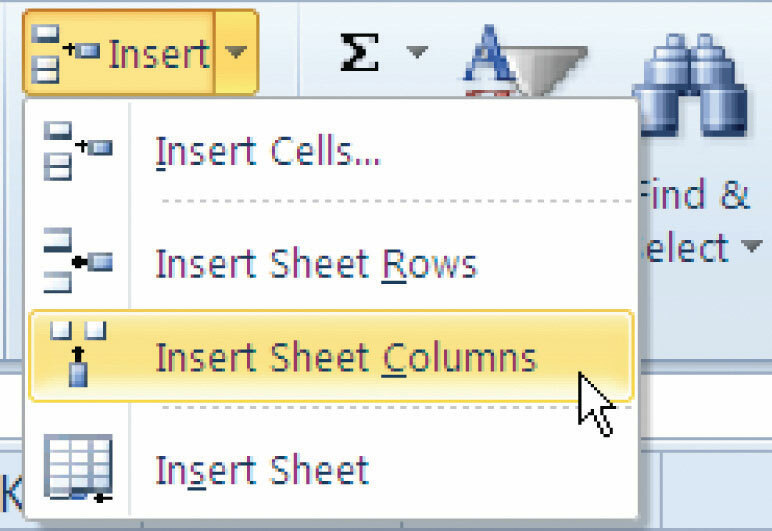 Excel will not accept these entries into a cell location. It slows down the data entry process. Which of the following statements is true with respect to editing the content in a cell location? Activate the cell location and press the F2 key on your keyboard to edit the data in the cell. Double click the cell location to edit the data in a cell location. Activate the cell location, click the Formula Bar, and make any edits for the cell location in the Formula Bar. 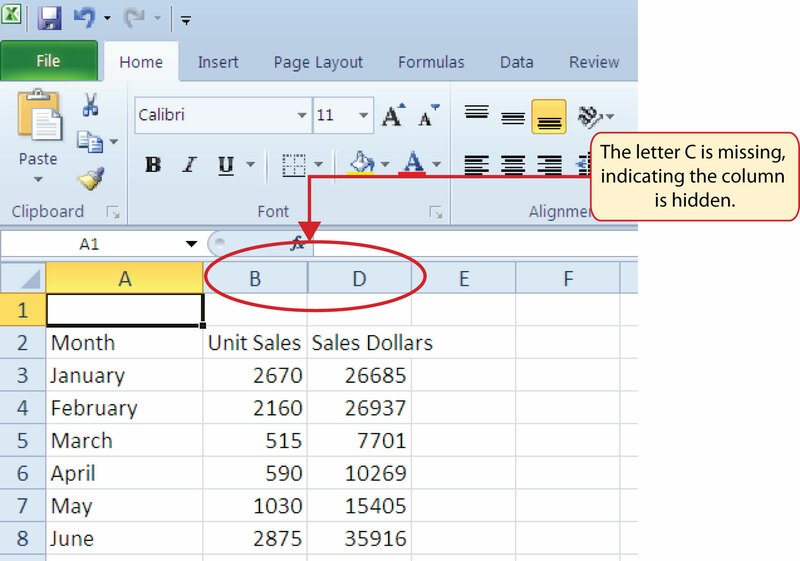 Which of the following will enable you to identify hidden columns in a worksheet? The column letter appears in a tip box when the mouse pointer is moved over a hidden column. Clicking the Page Layout View button in the View tab of the Ribbon shows all columns in the worksheet and shades hidden columns. The column letters that appear above the columns in a worksheet will be missing for hidden columns. Click the Hidden Columns indicator in the Status Bar. Which of the following is true with respect to inserting blank rows into a worksheet? 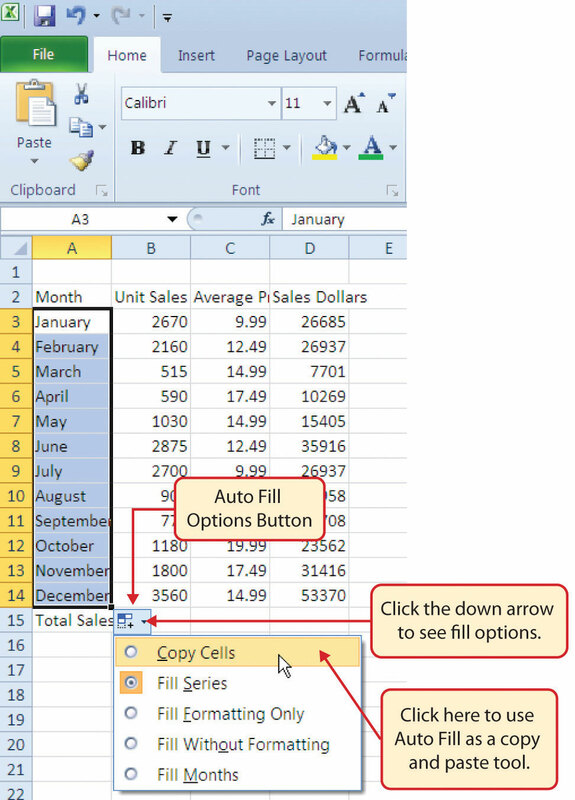 Blank rows are inserted above the activated cell or cell range in a worksheet. Blank rows are always inserted in the center of a cell range. At least two or more cells in a worksheet must be highlighted before a row can be inserted. The command for inserting blank rows and columns can be found by clicking the Format button in the Home tab of the Ribbon. When inserting blank rows into a worksheet, the Undo button is disabled. You must use the Delete button in the Home tab of the Ribbon to remove unwanted blank rows.